Our SMS gateway makes delivering text messages to prospects, customers and users easy. At Voodoo SMS, we offer competitively priced SMS gateway service for companies targeting users in the UK. With our user friendly platform, you can send bulk SMS online to your contact lists for marketing, notification or verification purposes. Our SMS gateway also allows you to receive text messages using our shortcode or your own long number. Thanks to our competitive bulk pricing, we’re one of the most affordable SMS gateway services in the UK. Buy one credit or one million credits to take advantage of the many benefits of SMS marketing for your business. Why should you use an SMS gateway? 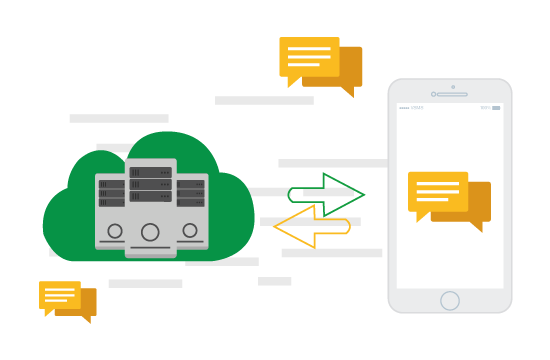 Our SMS gateway lets you deliver bulk text messages from a simple, user friendly interface with no need for expensive hardware or high-volume carrier plans. Your business can use our great mobile messaging infrastructure to reach new and existing customers with ease. Data from Ofcom shows that, as of 2014, more than 93% of adults in the UK own and regularly use a mobile phone. Text messages are the most frequently opened marketing channel, with a significantly higher open rate than email marketing. SMS marketing is also much more affordable than traditional direct mail, making it a great way for your business to generate new sales leads, attract new customers, boost customer loyalty with a promotion or simply keep your existing customer base informed about new events. With our powerful bulk SMS gateway, you don’t need any special technical skills to launch your own mobile text message marketing campaign. No matter how big your marketing list is, our UK SMS gateway has more than enough power to make sure you reach your entire audience. Our system is capable of delivering your message to hundreds of thousands of phone numbers at a time, letting you market to even the largest list. With our competitive volume-based pricing, your cost per message will decrease as the scale of your campaign increases. With our highest volume credit plan, you’ll only pay 1.74p per credit to deliver your SMS campaign to its target audience. If you’re a small business without a large marketing list, you can also use our text gateway to attract new customers and generate sales. Our platform allows you to fund your account for as little as one message, giving you full control over your spending and campaign scope. You can receive text messages from your target audience online using our shortcode or a long telephone number, making it quick and simple for your customers to respond to your message and claim your offer. Our platform makes it easy to customise your SMS with data such as a person’s name, online username and other information. Dynamic messages make your SMS campaign feel far more personal, increase your response rate and improving your campaign’s results. Whether you have a list of hundreds of contacts or hundreds of thousands, our powerful SMS gateway makes marketing to your target audience by using SMS simple. Create your account to set up your first campaign and start communicating with your customers or app users now.